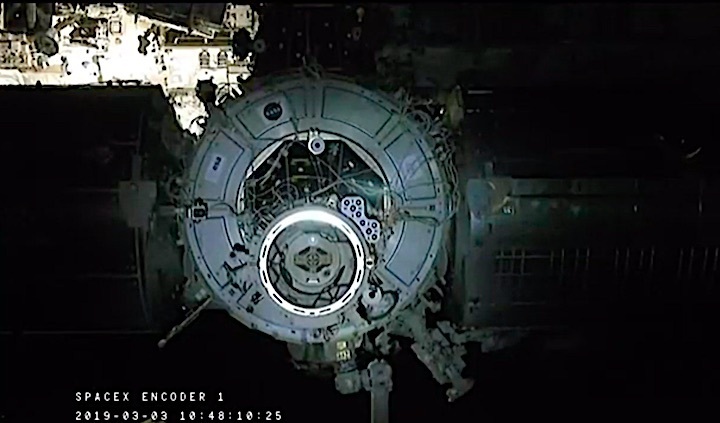 Astronauts floated into a SpaceX crew capsule for the first time in orbit Sunday morning, following its safe arrival at the International Space Station. 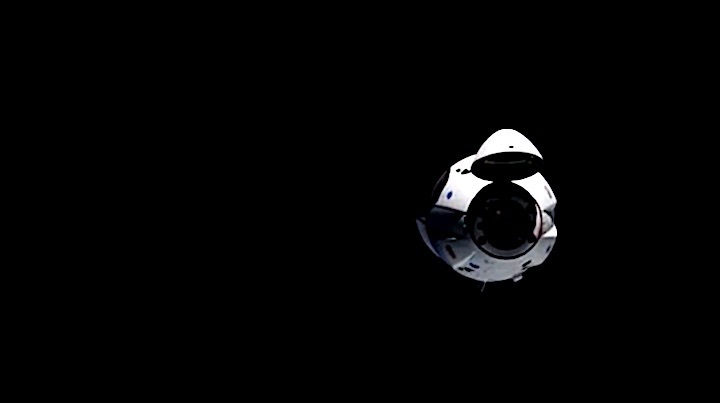 A day after launching from Kennedy Space Center on a first test flight, the Crew Dragon eased into a docking port at 5:51 a.m., becoming the first privately designed and operated spacecraft capable of carrying people to visit the outpost. 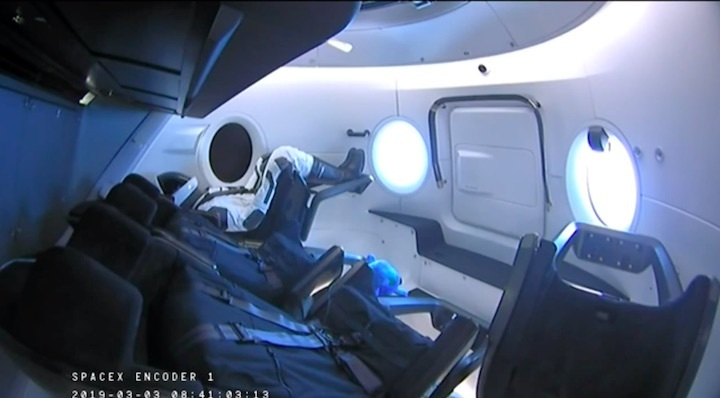 Hours later, three station crew members swung open a hatch and officially welcomed the spacecraft and its simulated passenger, Ripley, a spacesuit-wearing test dummy strapped in a seat. 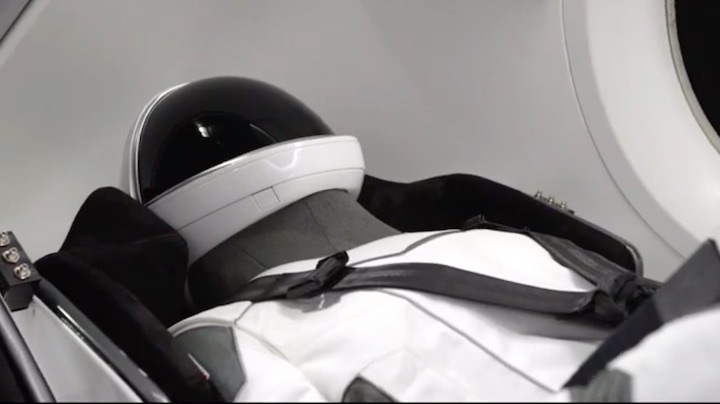 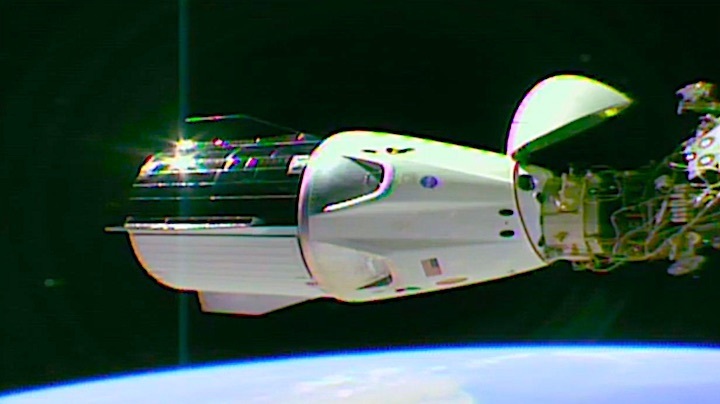 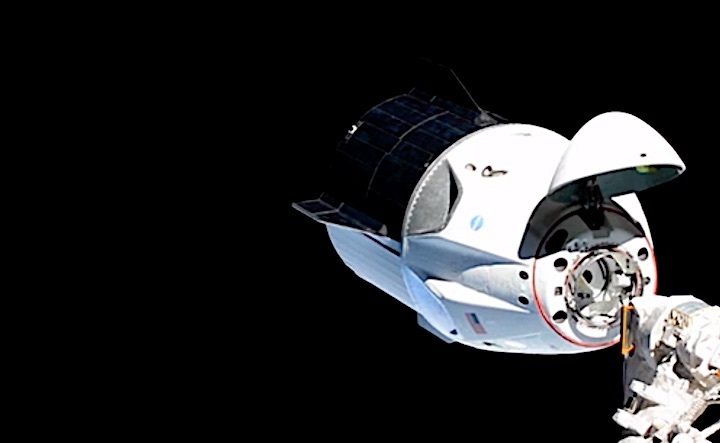 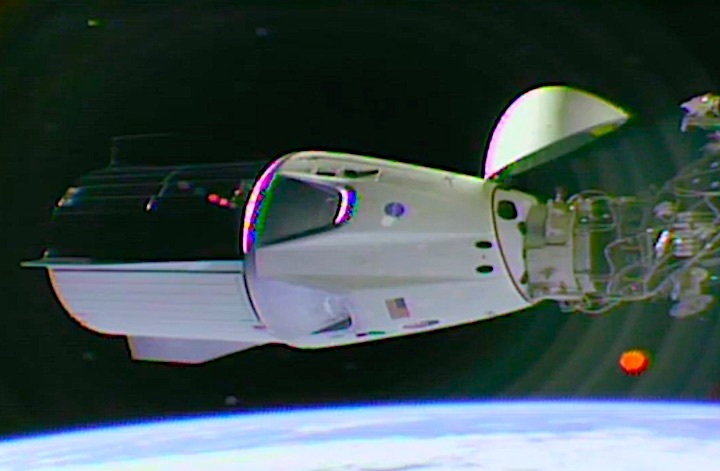 The next time a Crew Dragon visits, a pair of NASA test pilots should emerge from its hatch — potentially the first humans to launch from U.S. soil since the final space shuttle mission nearly eight years ago. 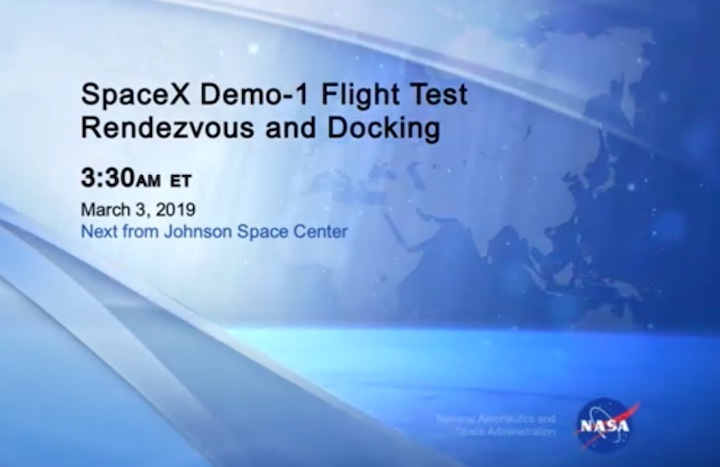 SpaceX is targeting a July launch of a second demonstration mission, called Demo-2, that would send former shuttle astronauts Bob Behnken and Doug Hurley to the station. 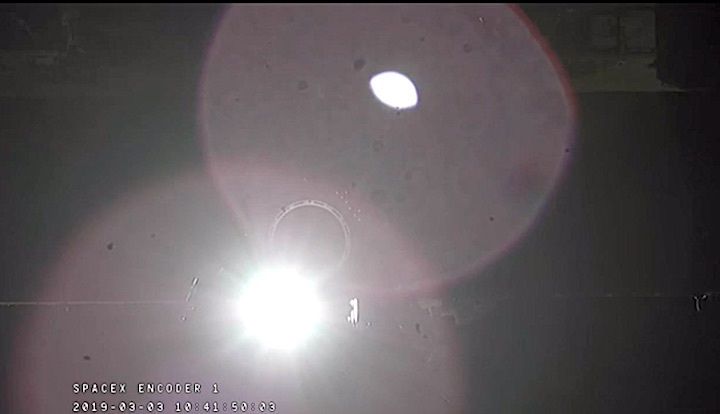 The current Demo-1 mission for NASA's Commercial Crew Program blasted off from the Space Coast atop a Falcon 9 rocket at 2:49 a.m. Saturday. 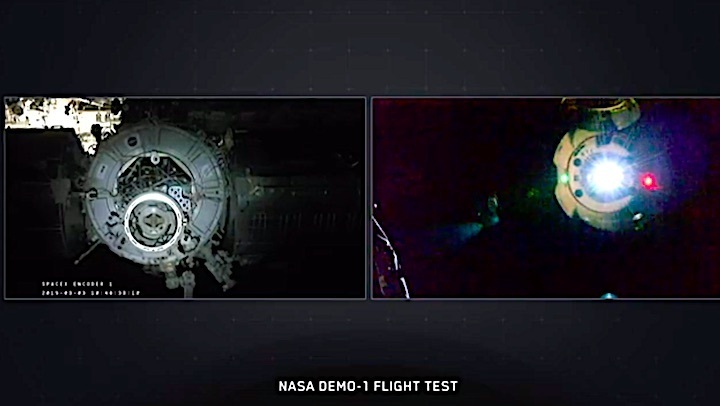 "Just to see the years of work kind of come to fruition as we watched the Falcon launch into the sky, it was awesome," said Hurley. 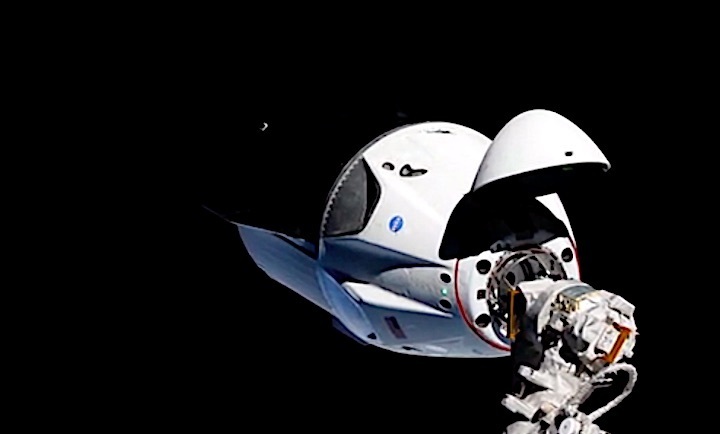 NASA first partnered with SpaceX on crew systems in 2010, and in 2014 awarded the company a $2.6 billion contract to fly astronauts. 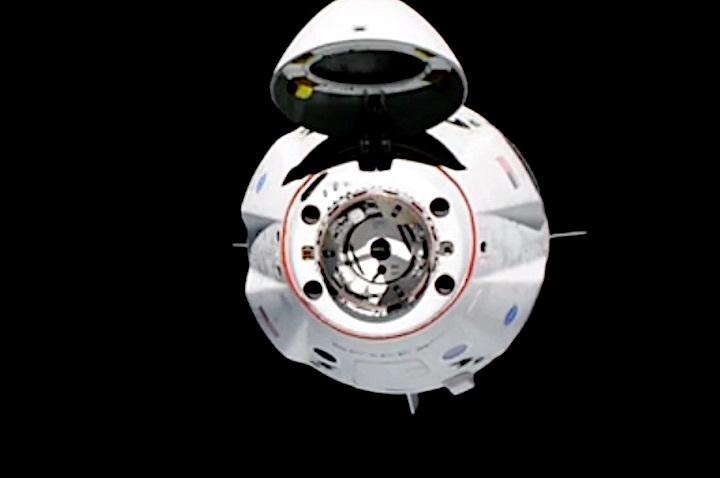 Boeing won a $4.2 billion contract to develop the CST-100 Starliner capsule. 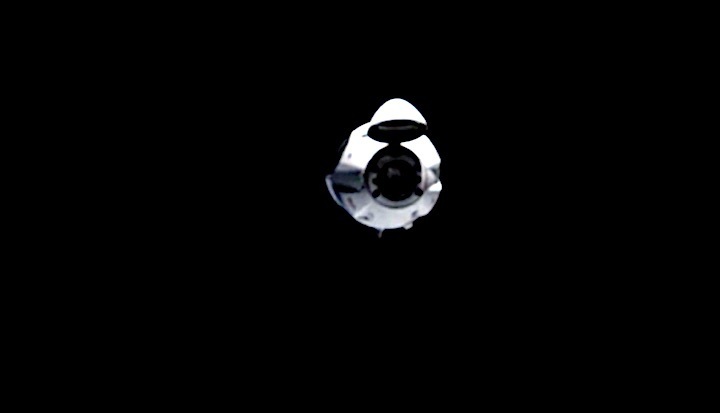 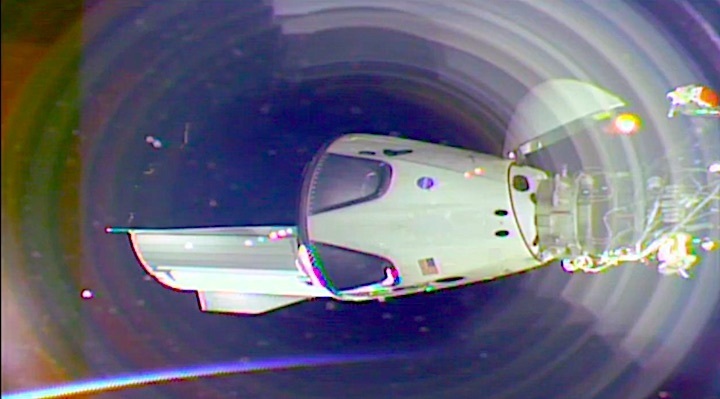 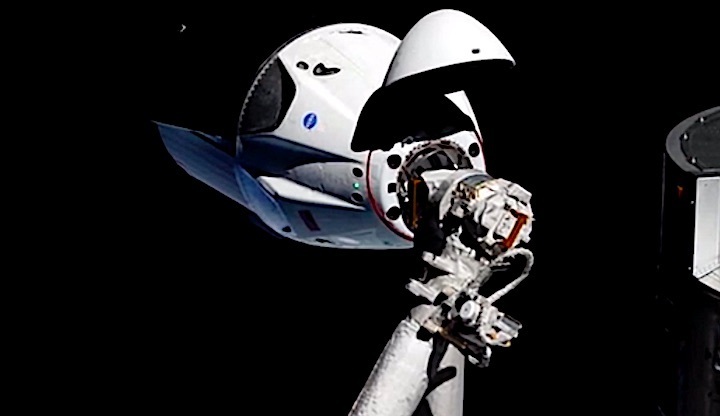 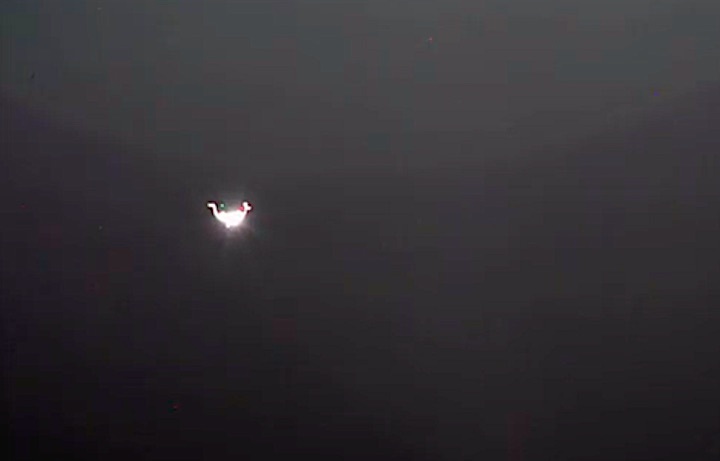 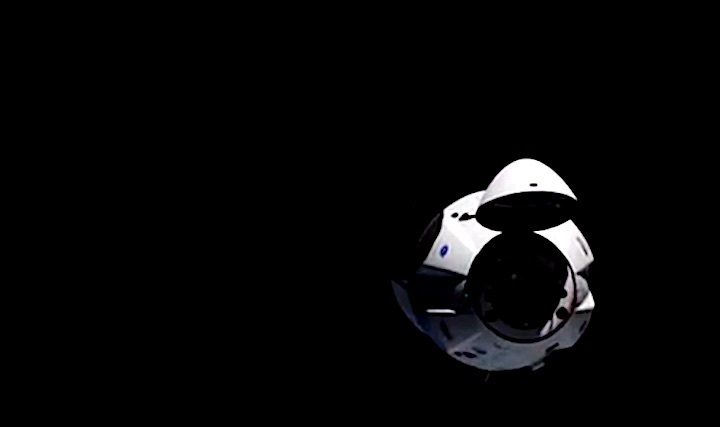 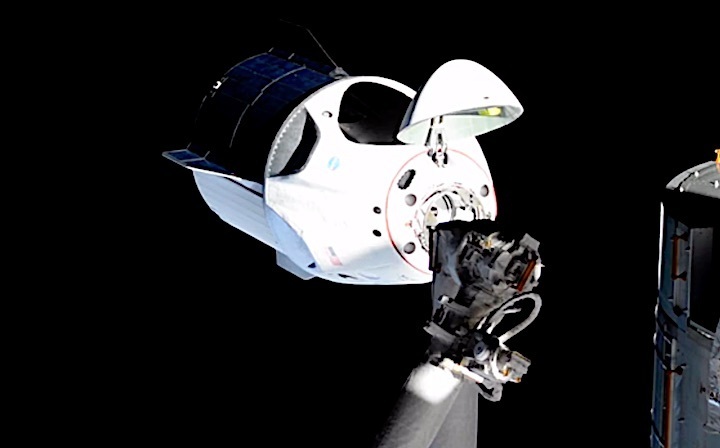 Steered by flight computers early Sunday, the Crew Dragon, with a nose cone pulled back on a hinge to reveal its docking ring, completed a series of tests during a slow, steady approach to the station. 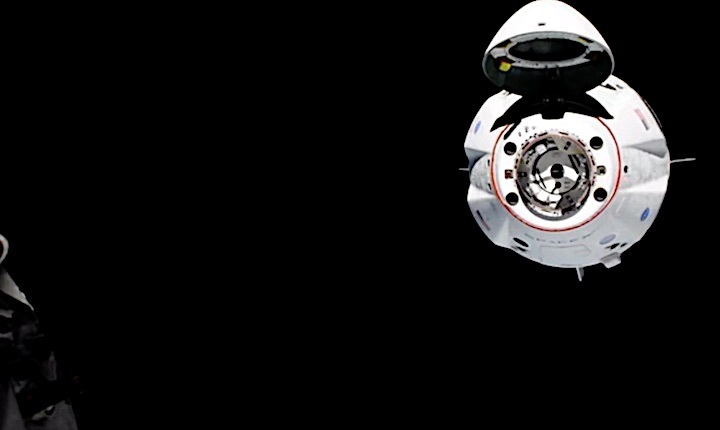 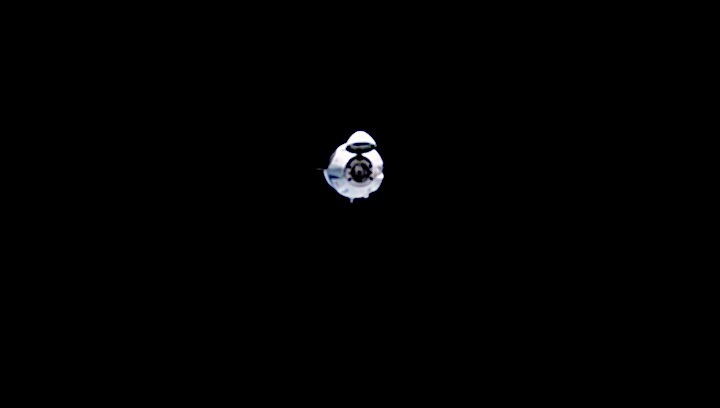 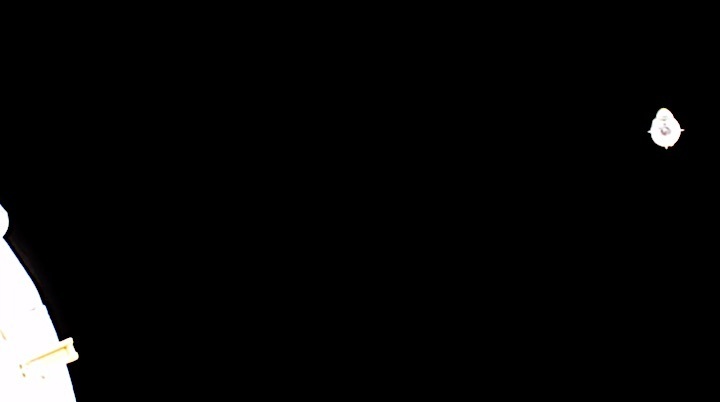 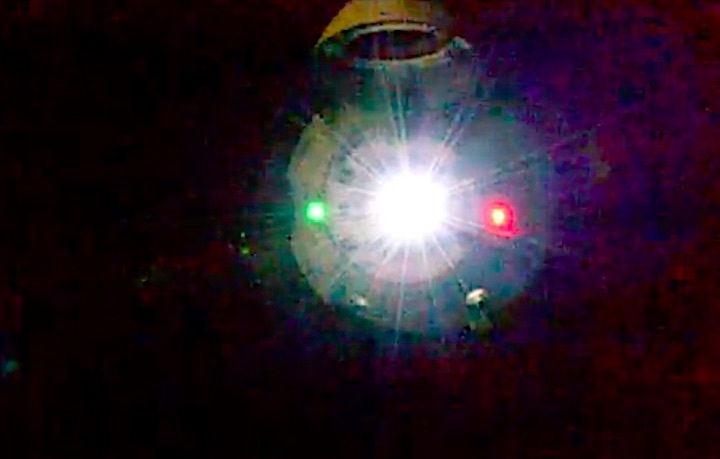 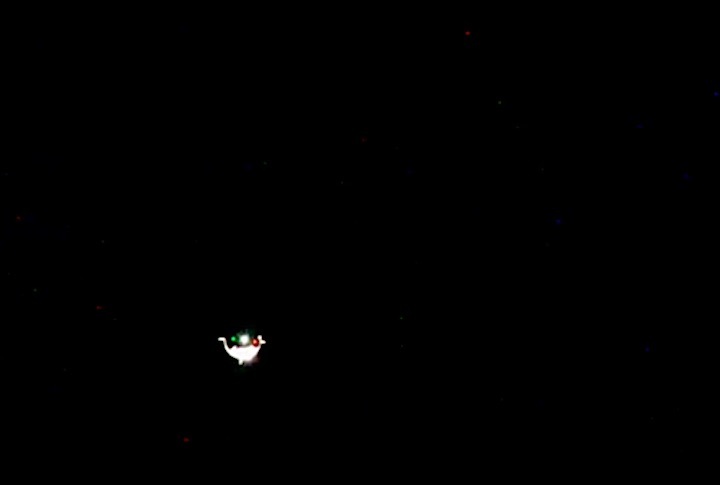 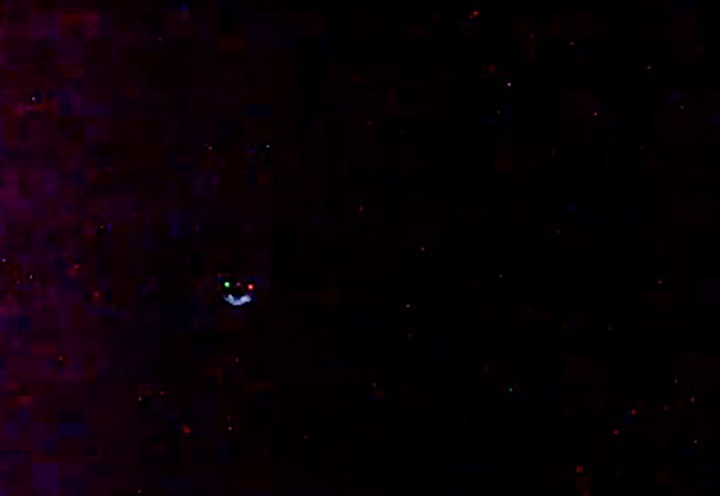 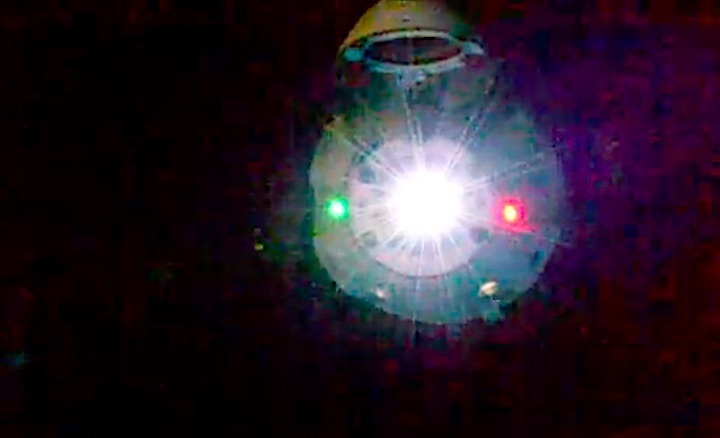 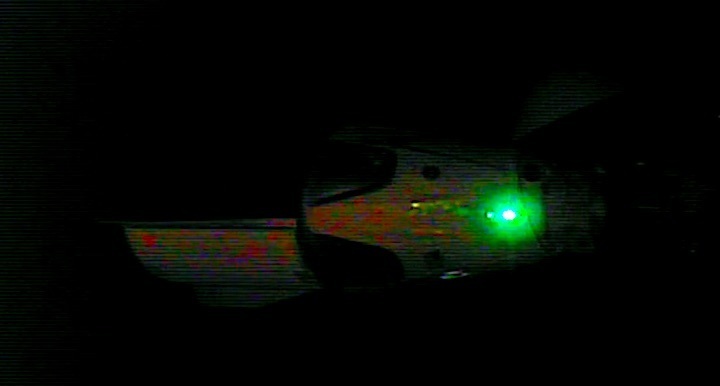 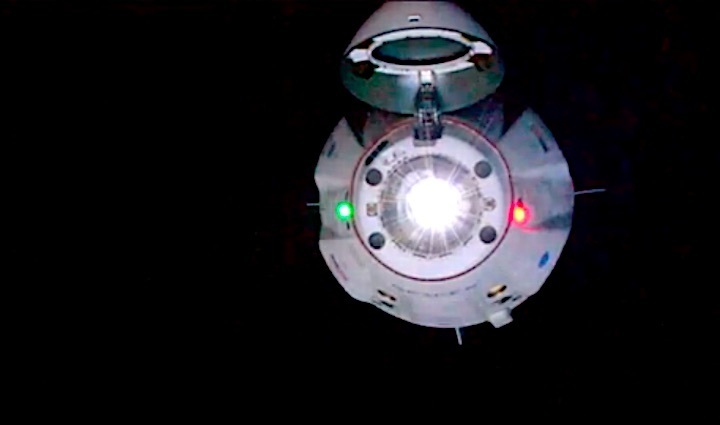 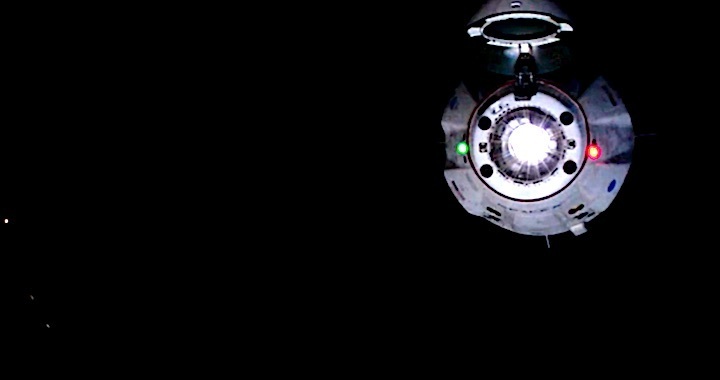 Before the final "go," the capsule fired thrusters to stop and retreat, as it would if computers sensed trouble. 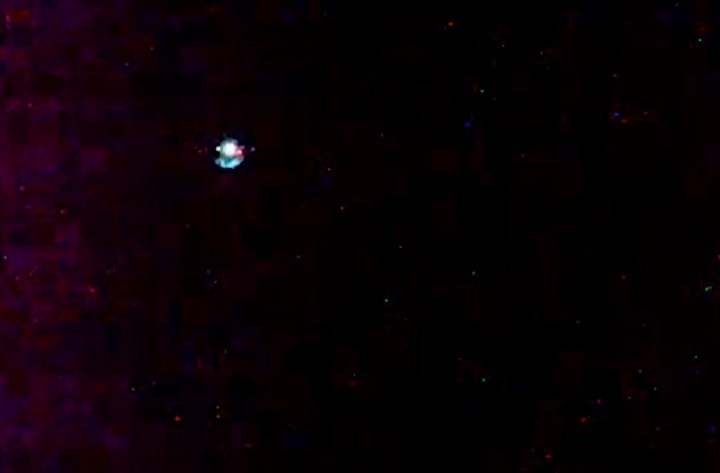 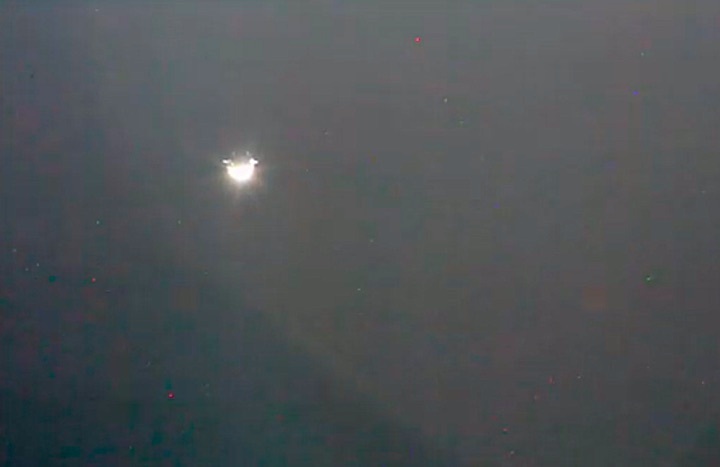 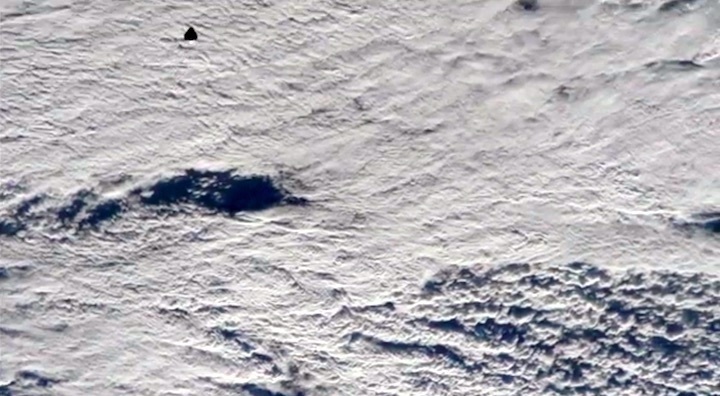 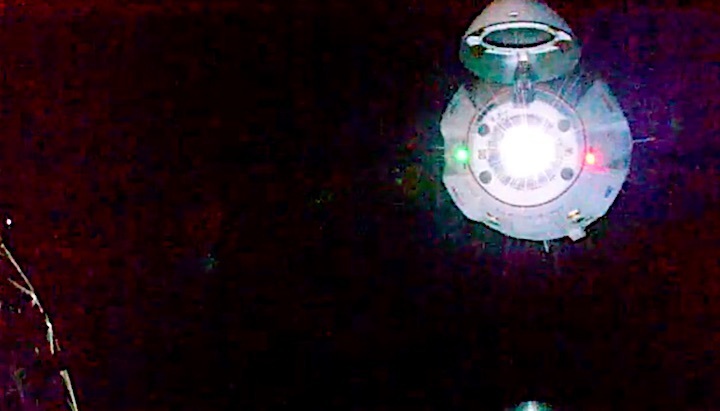 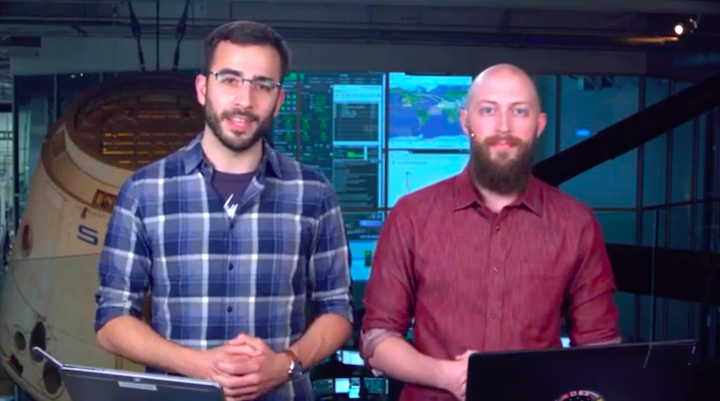 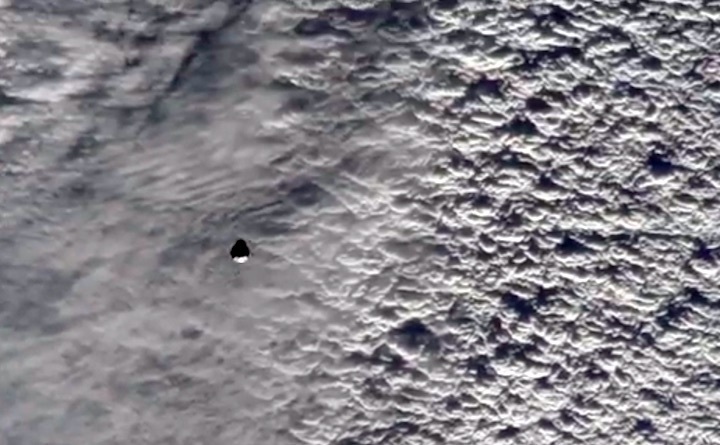 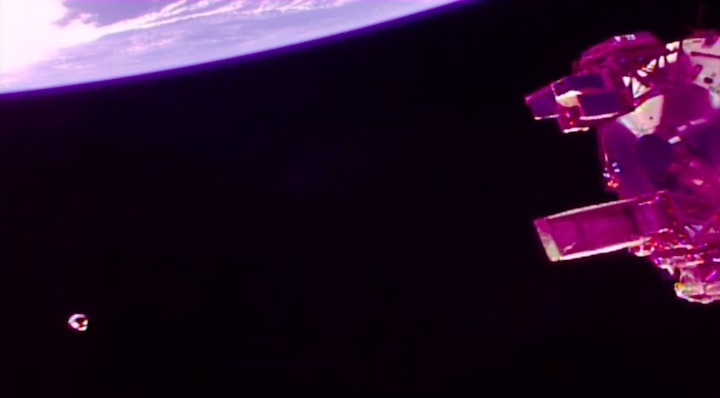 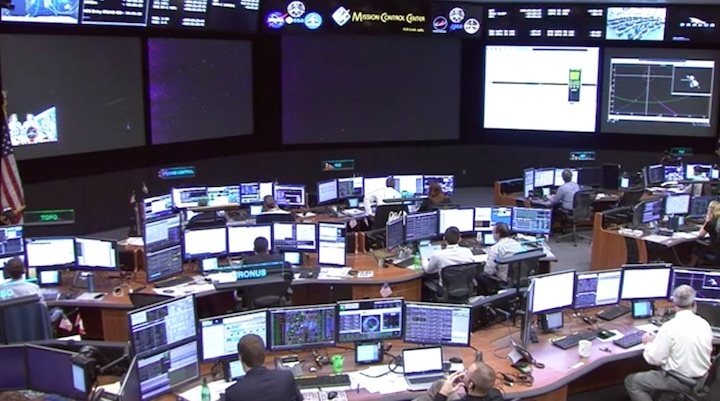 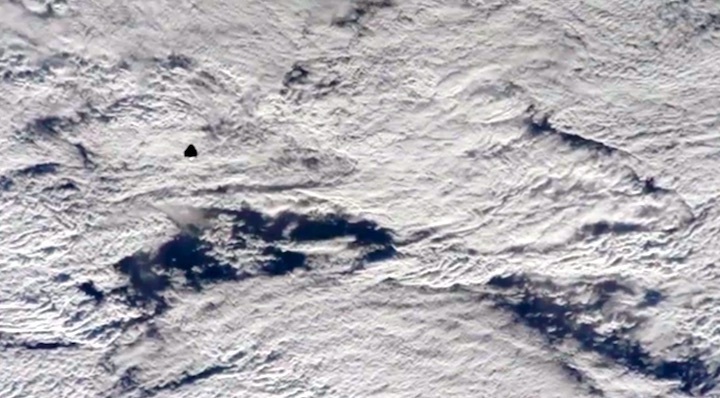 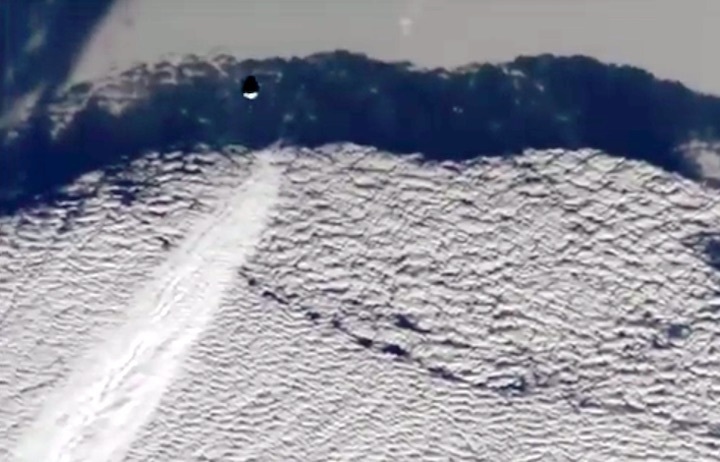 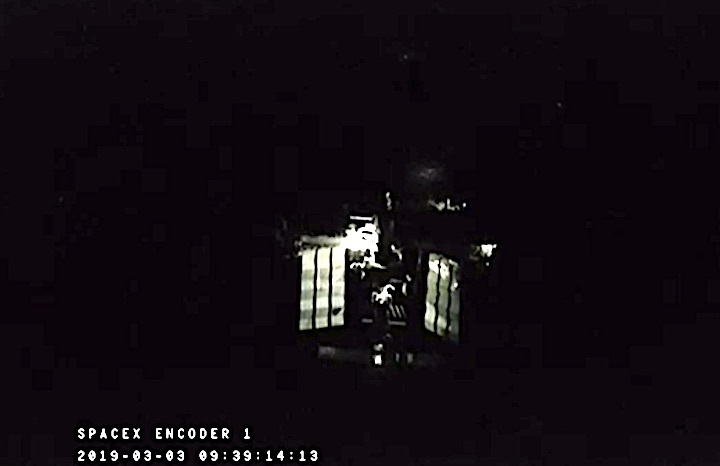 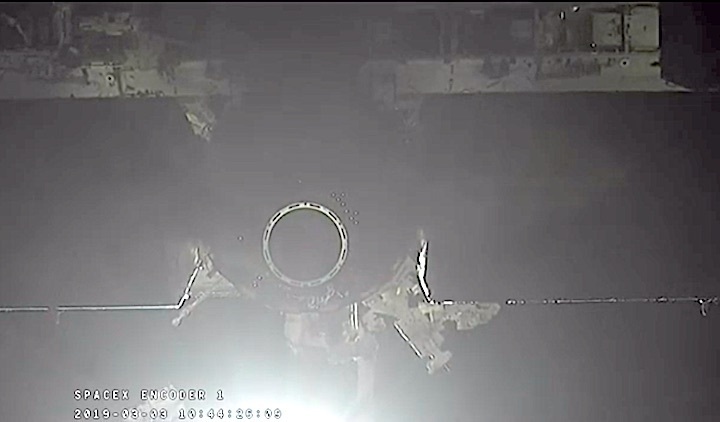 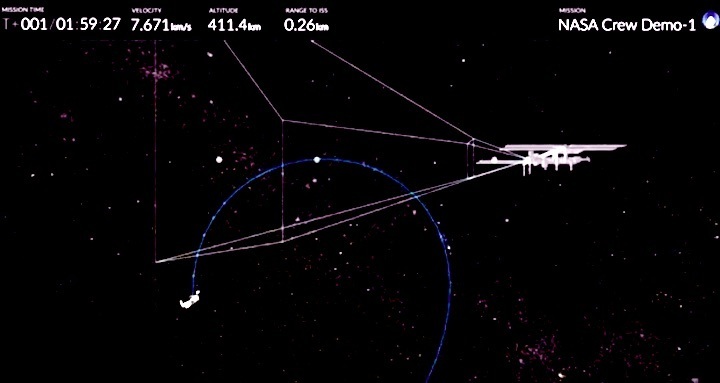 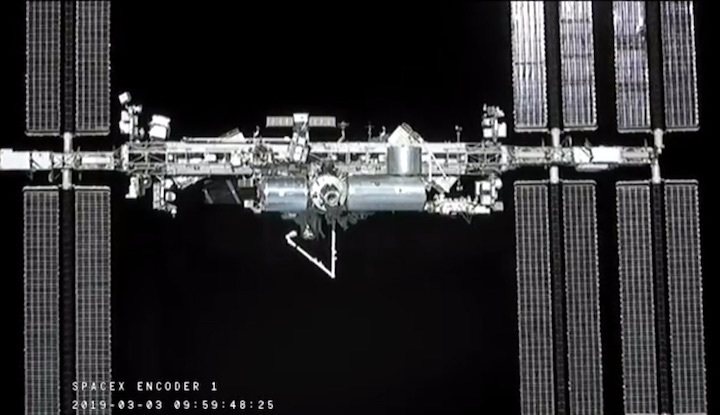 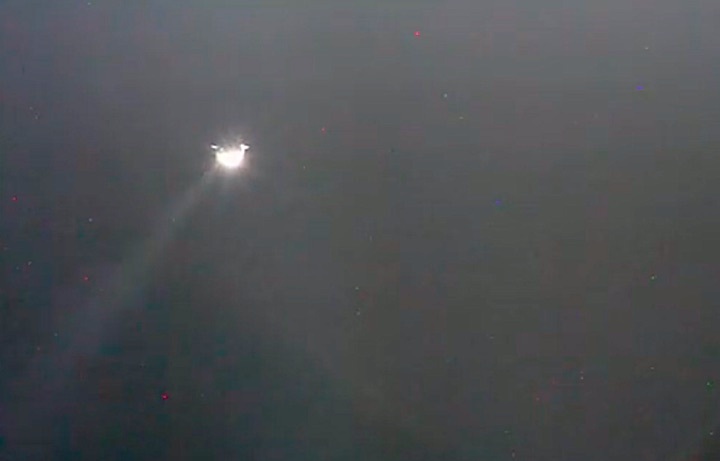 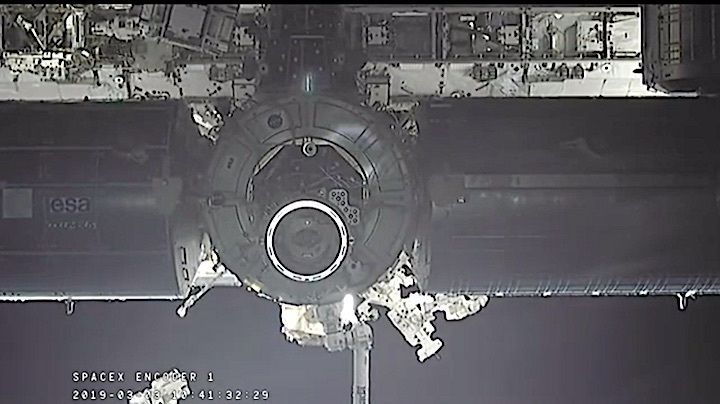 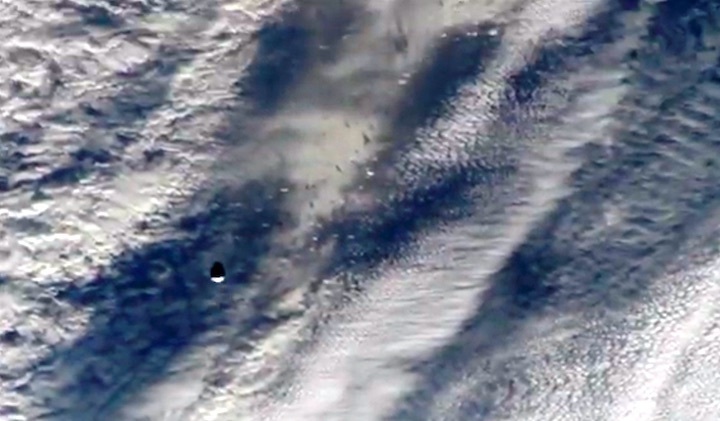 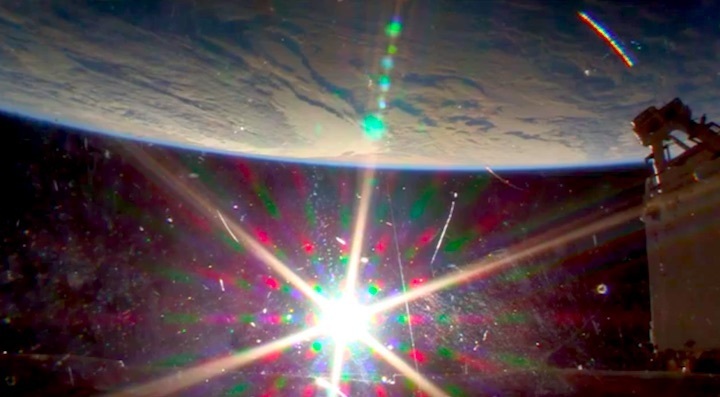 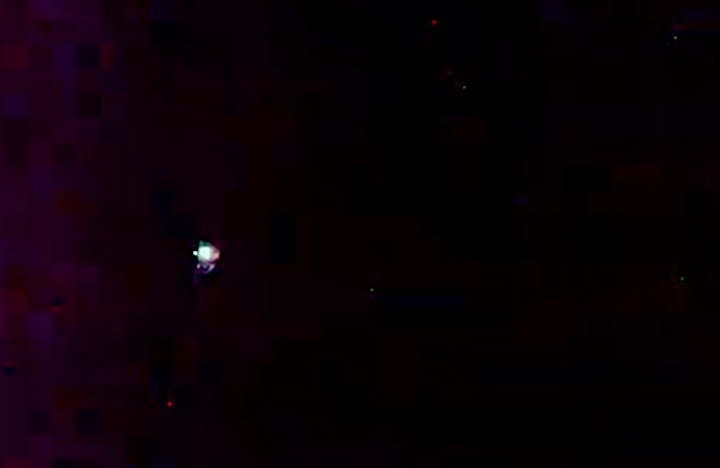 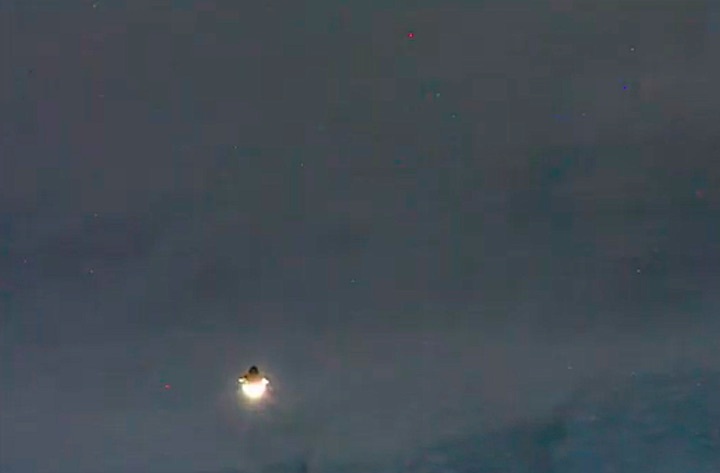 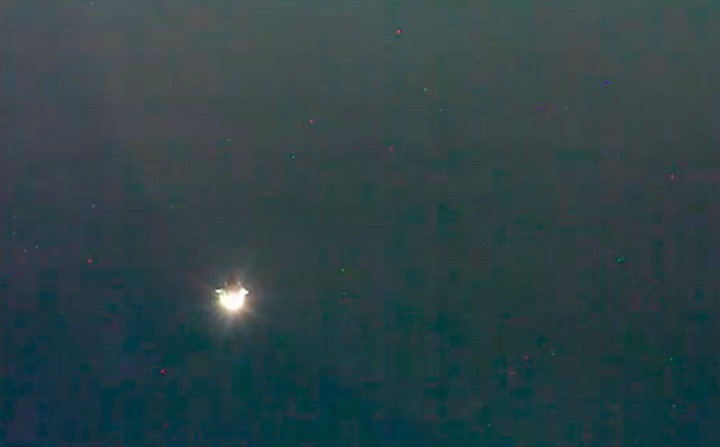 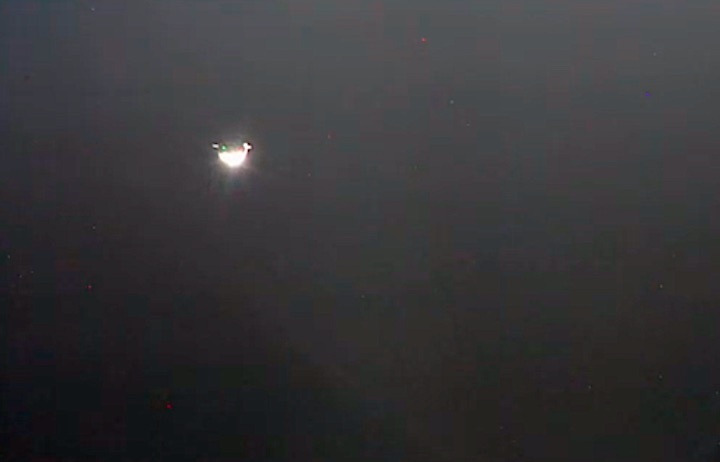 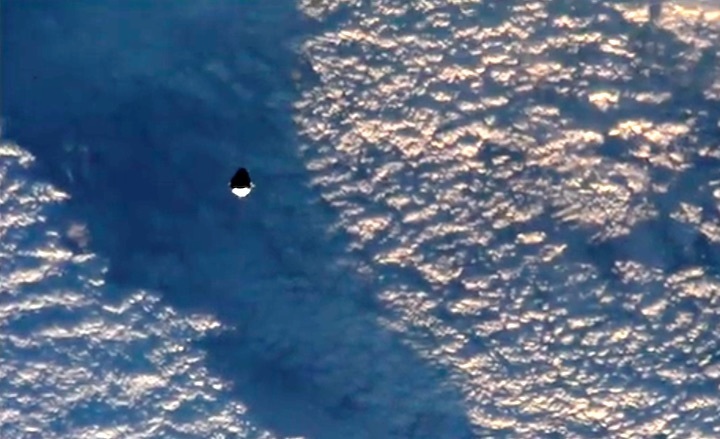 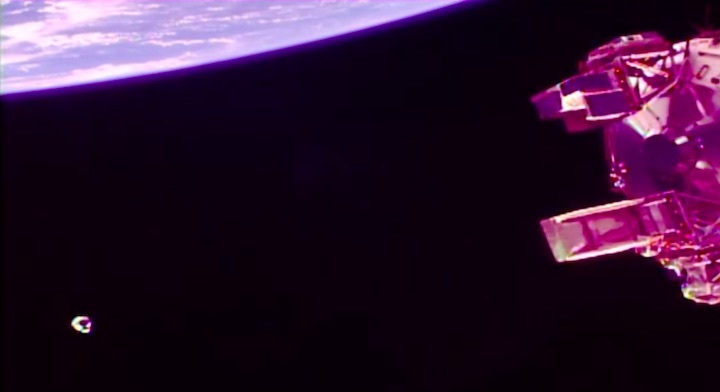 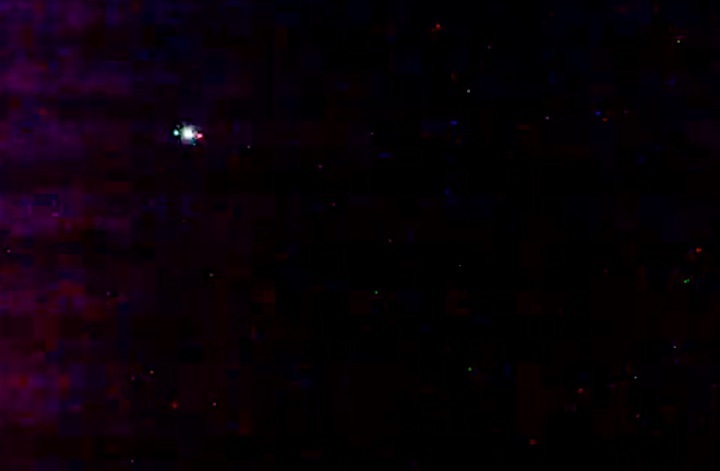 “Soft capture confirmed,” McClain radioed as the two spacecraft connected 260 miles above Earth north of New Zealand, both traveling 17,500 mph relative to earth. 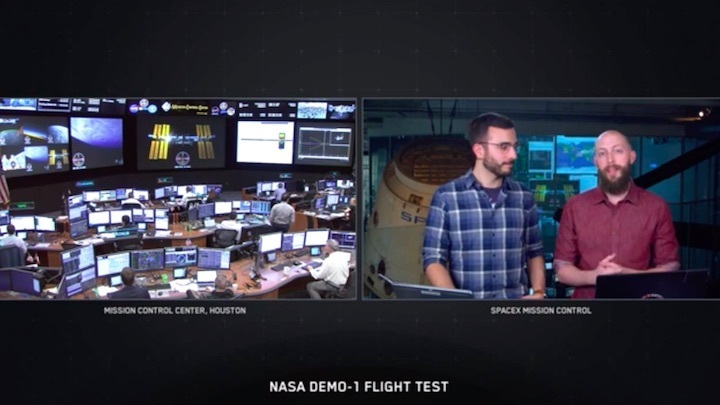 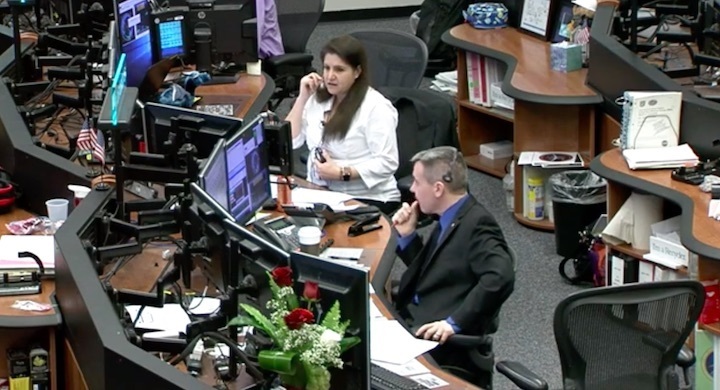 Mission teams applauded at SpaceX headquarters and at NASA's Johnson Space Center in Houston. 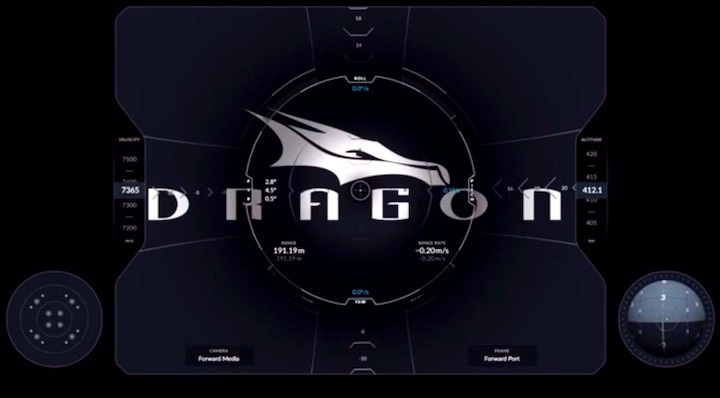 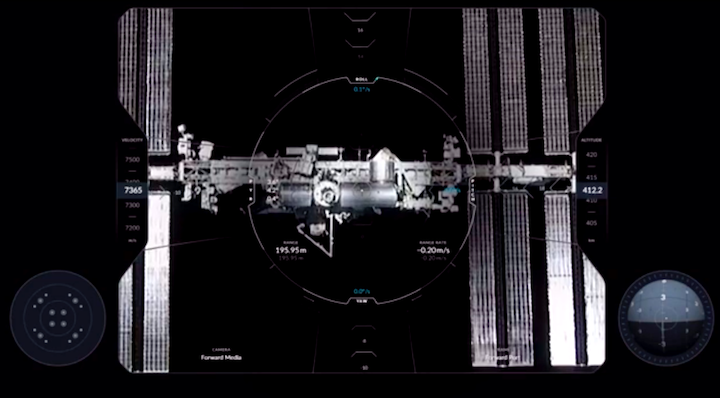 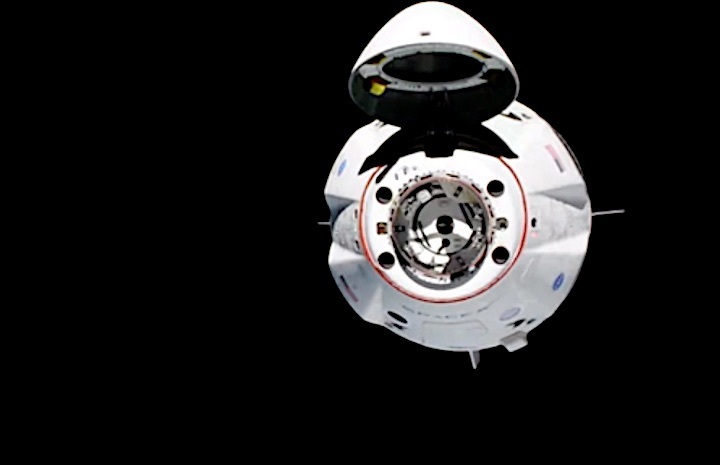 The autonomous docking was a first by a Dragon. 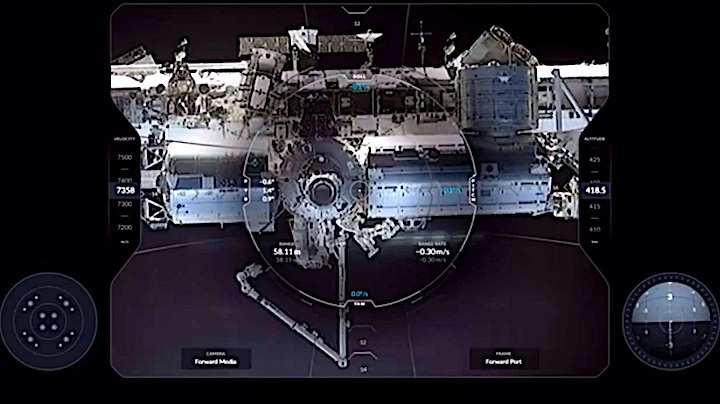 Cargo versions that have visited the station 16 times fly close to the complex before being snared by a robotic arm and reeled into a port. 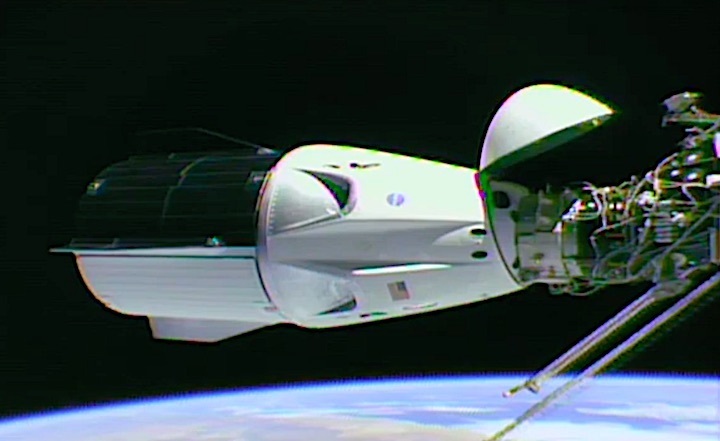 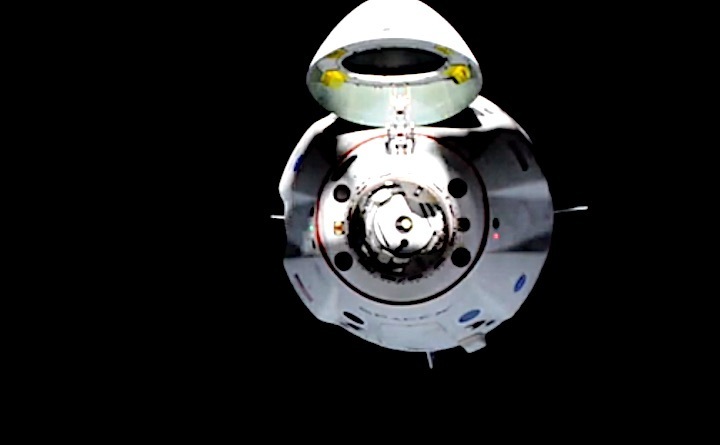 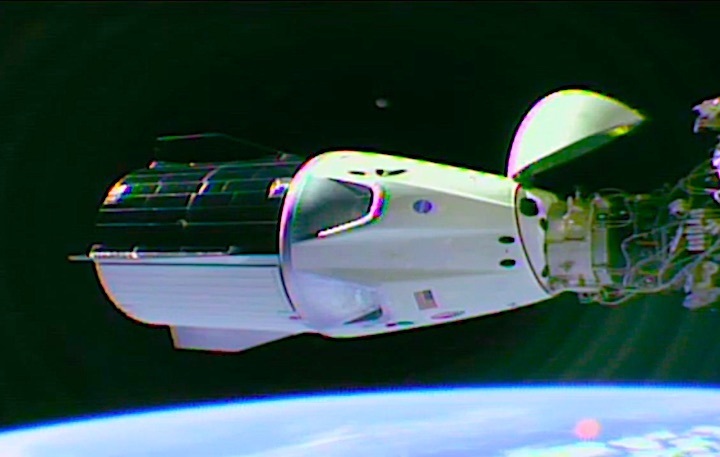 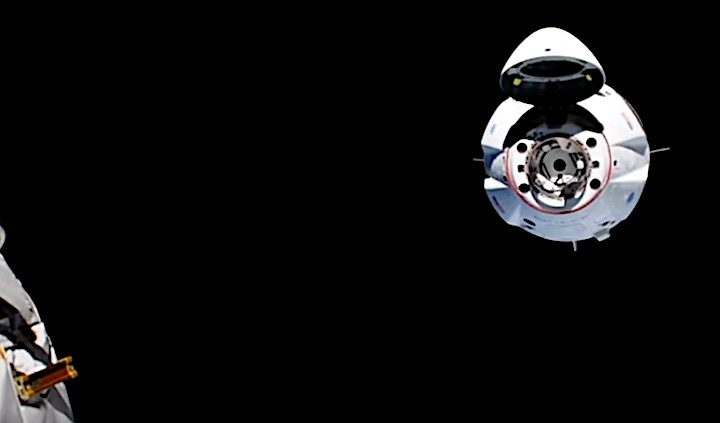 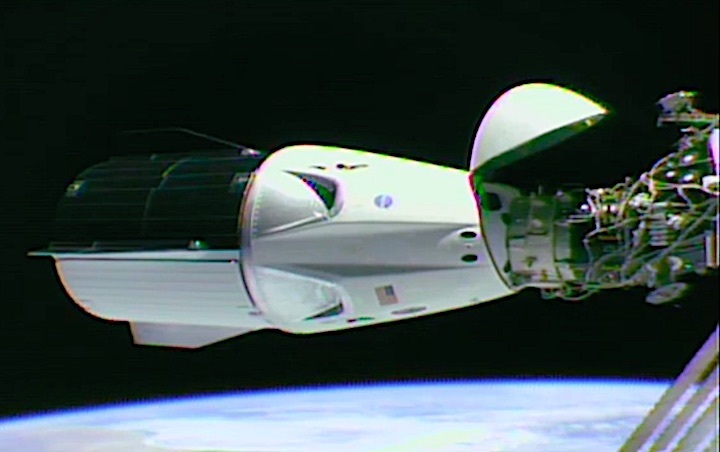 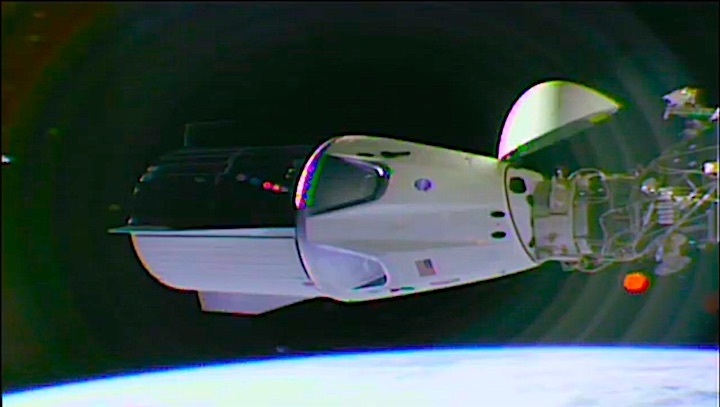 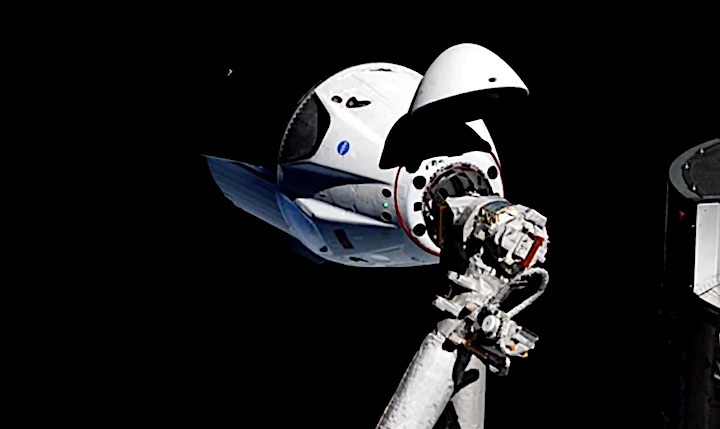 The Crew Dragon, also called Dragon 2, stretches 27 feet from the tip of the habitable crew capsule to the bottom of an attached “trunk,” or service module. 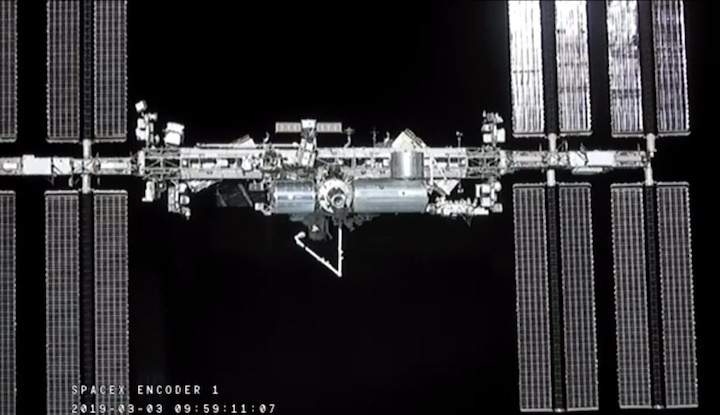 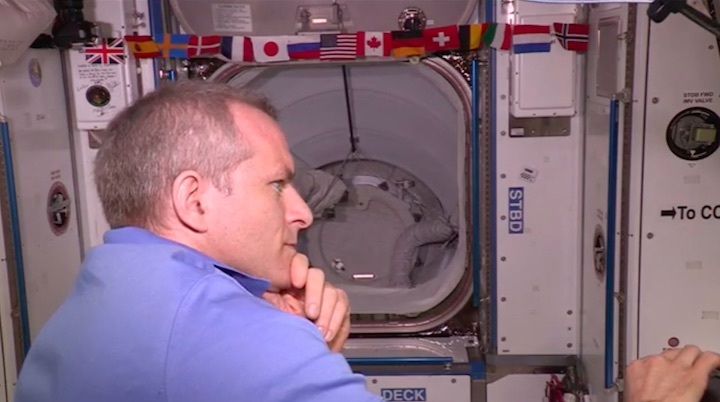 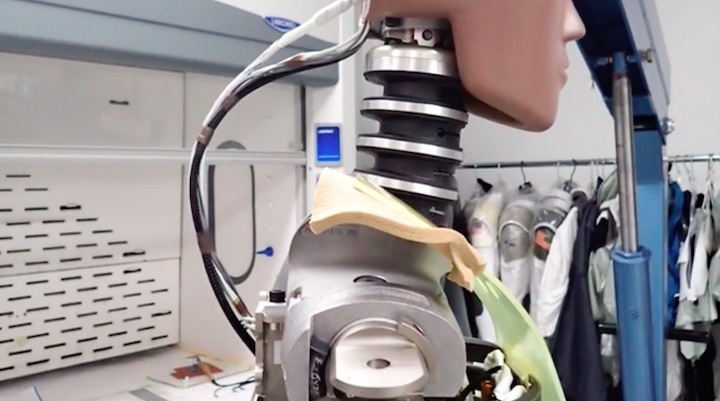 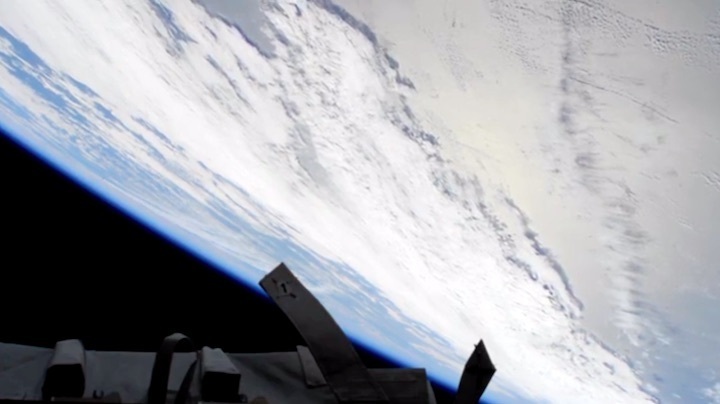 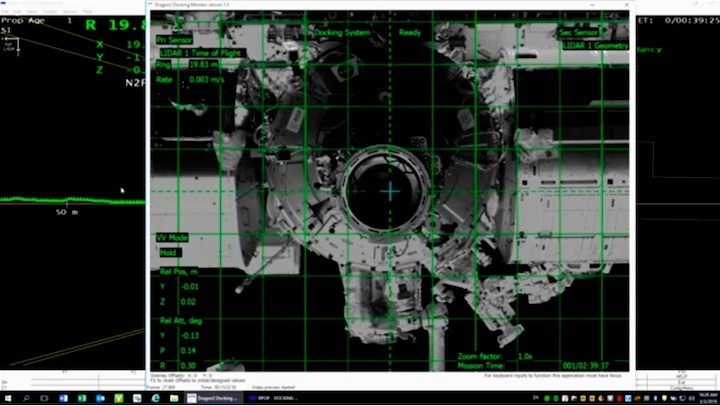 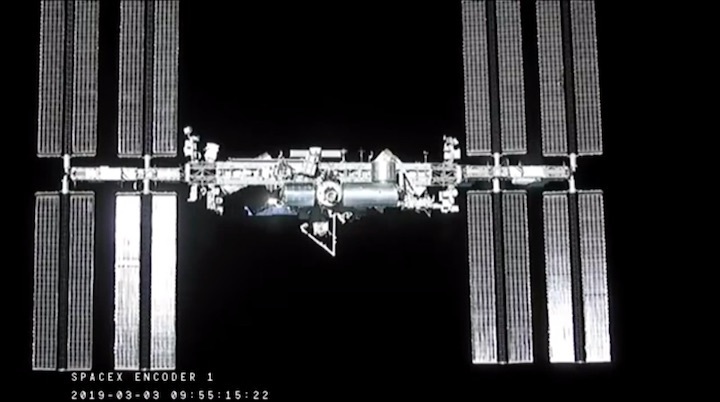 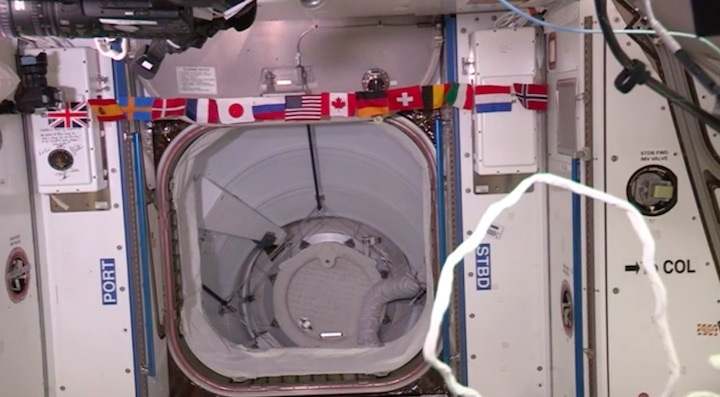 "A great new addition to the quiver of tools we have, humans, to further space exploration," said Canadian astronaut David Saint-Jacques, part of the station's Expedition 58 along with McClain and Russian commander Oleg Kononenko. 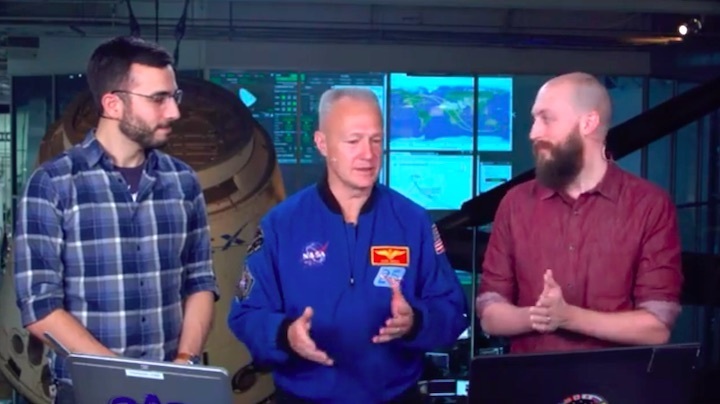 "This is a good day, the first day of a new era for the next gen of space explorers." 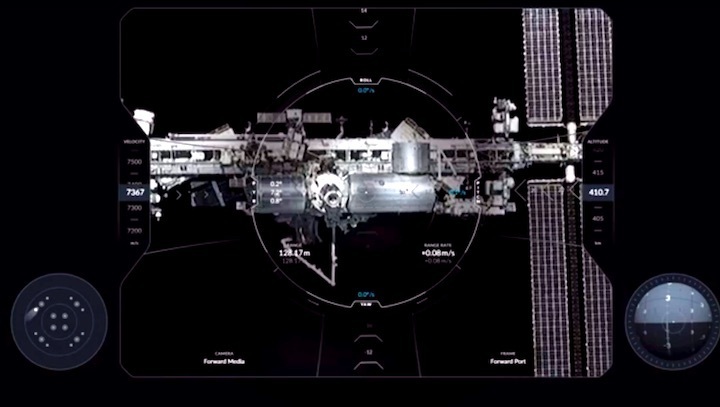 The capsule is scheduled to spend five days at the station, occupying the same port last used by Atlantis on the final shuttle mission in July 2011. 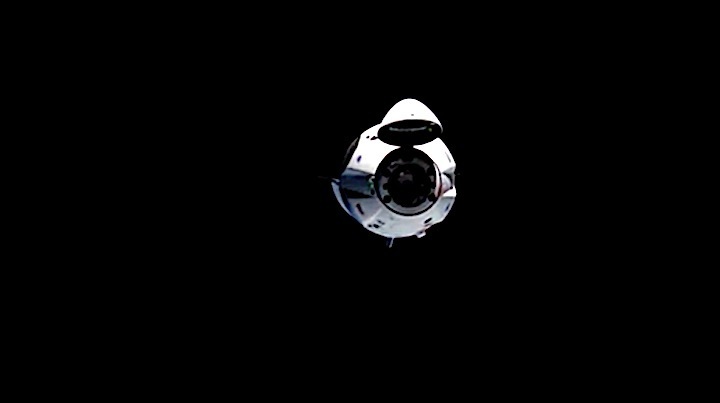 Departing Friday morning, the spacecraft will attempt to show it can safely drop from orbit, deploy parachutes, and splash down in the Atlantic Ocean well off the coast of Florida, for recovery by a SpaceX ship. 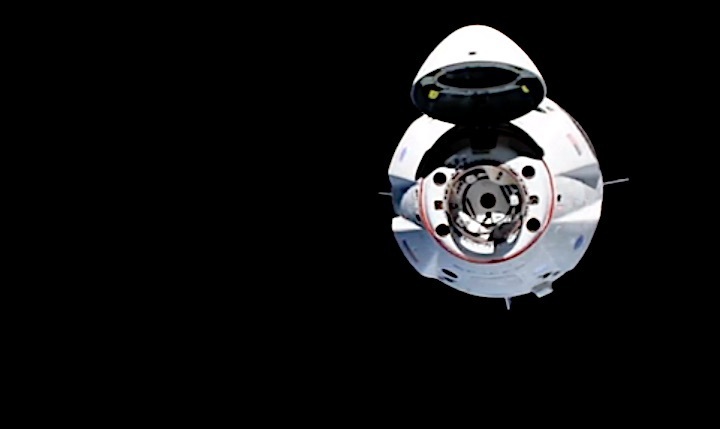 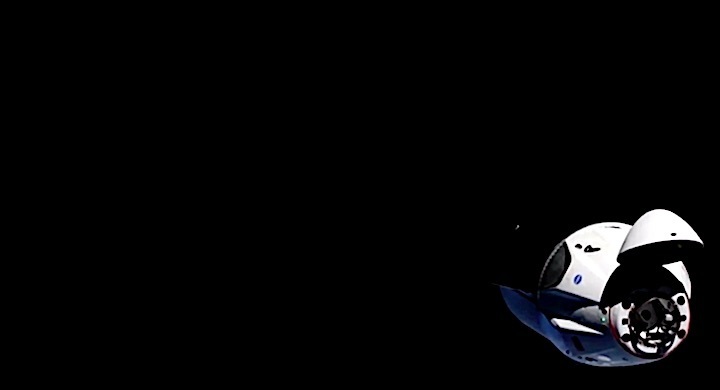 As soon as June, SpaceX will use the same capsule for an in-flight test of its ability to escape a failing rocket during the most stressful part of a launch, by firing powerful SuperDraco thrusters. 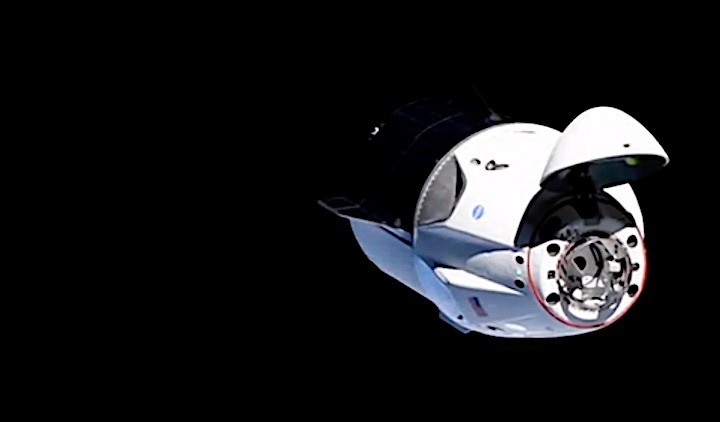 Then it may be finally time to launch people from Kennedy Space Center again. 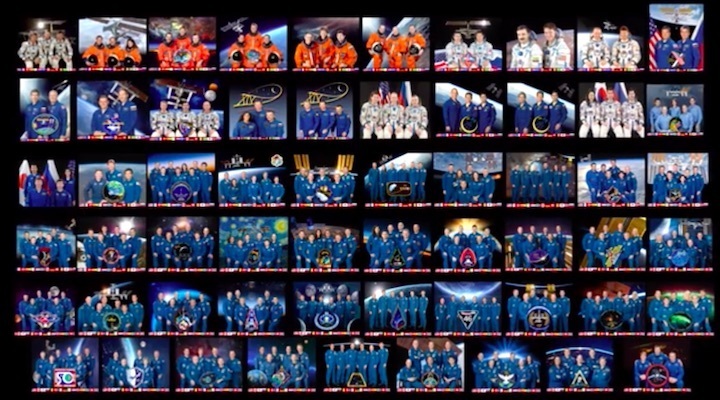 NASA astronauts have relied on Russia for rides to and from the station since the shuttle’s retirement. 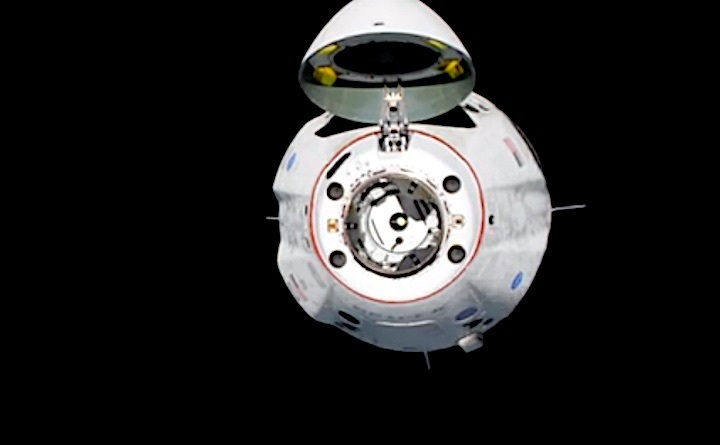 Boeing is targeting an uncrewed Starliner test flight no earlier than April, lifting off from Cape Canaveral Air Force Station atop a United Launch Alliance Atlas V rocket. 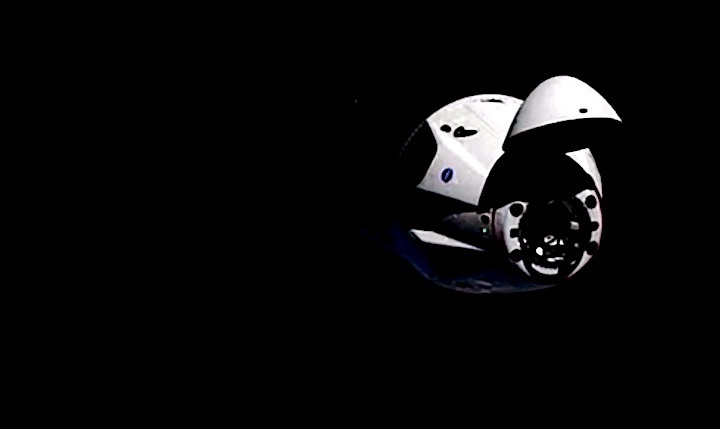 It could be ready to fly a three-person test crew by August. 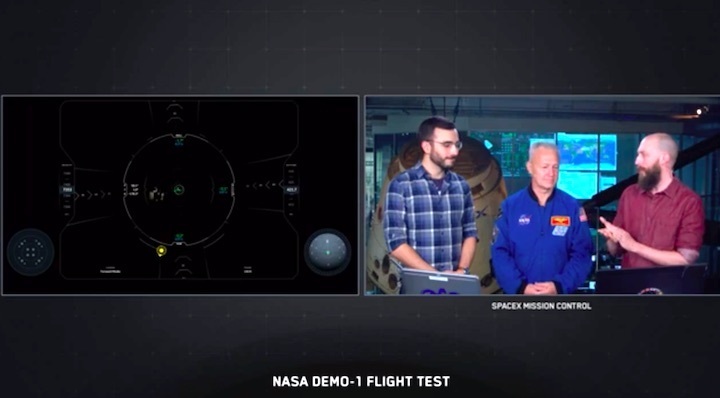 After that, NASA will certify the systems' safety to regularly launch four-person crews. 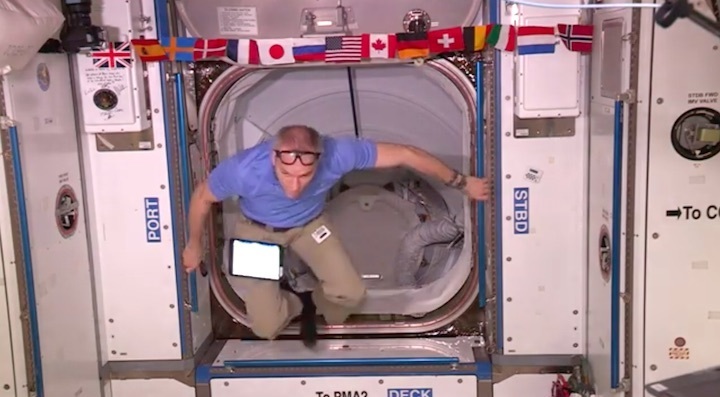 "These amazing feats show us not how easy our mission is, but how capable we are of doing hard things," said McClain.